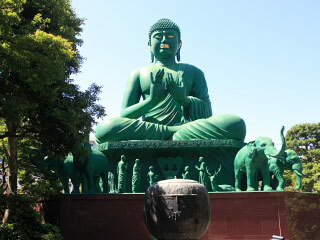 Nagoya Daibutsu (名古屋大仏) is a great Buddha Statue of Nagoya. It is located in Toganji Temple. It is 10m tall and his base is 5m tall. So, in total height is 15m. Unlike other Daibutsu. This statues is not surrounded by Lutus, but Elephants. It was built in 1987. It is made from Bronze. 1. use Nagoya Metoro Higashiyama Line to Motoyama Station. Toganji is Soto Zen Buddhism Temple located in Nagoya, Aichi Prefecture. It was established in the middle of 16th century by Oda Nobuyuki for his Father, Oda Nobunaga who is the father of Oda Nobunaga. This statue was constructed in 1987. 10m tall and 5m for his chair. Eyes, lips and ears are printed in gold, and everything else is painted in green.